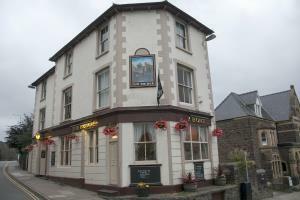 A premier double/twin room with en suite.The main entrance is the door to the inn.The building is Victorian and is not suitable for disabled patrons as there is no disabled access to the rooms.River View, Conwy Room and Moose Rooms are on the Second Floor.Rooms can be made as twin rooms if required. Family rooms available .All rooms are en suite with tea and coffee making facilities, televisions and hairdryers. Brewery Themed Rooms.The main entrance is the door to the inn.The building is Victorian and is not suitable for disabled patrons as there is no disabled access to the rooms.River View, Conwy Room and Moose Rooms are on the Second Floor.Rooms can be made as twin rooms if required. Family rooms available .All rooms are en suite with tea and coffee making facilities, televisions and hairdryers.